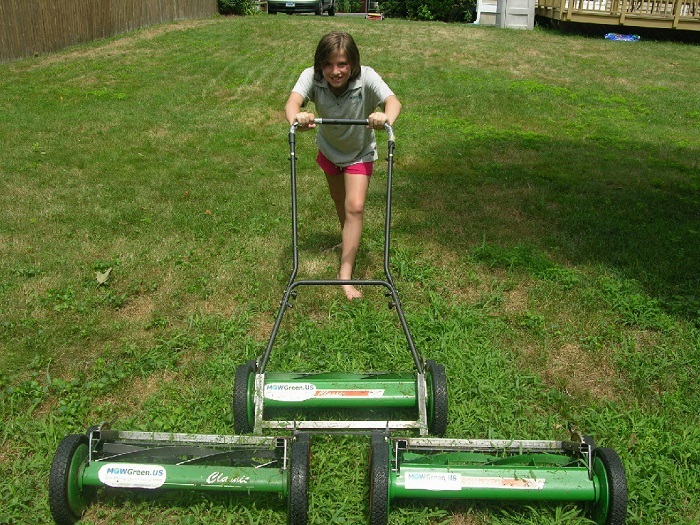 With gas prices continuing to soar, one of the ways families can reduce the amount of gas they consume is by switching out their own gas powered lawn mower to an eco friendly push reel mower. These self powered machines are affordably priced, easy to use, and benefit the environment while saving you money. Have you ever tried mowing grass when it’s too long? The grass binds up into the blade and really makes pushing the mower hard work. As difficult as it is to cut long grass with a power mower, using a manual mower to cut a overgrown lawn is even more difficult. For best results, it’s best to cut the lawn on a regular weekly schedule, and not let it get more than four inches in height. With only a few inches of growth to cut through, you’ll discover that the push mower will be much easier to manage and will do a more even job of cutting the grass. Since you are the “motor” behind a manual mower, pushing the reel mower at a steady pace does the best job of cutting the grass. A slow or erratic pace has a tendency to wrap the grass around the axle and will bind up the blades. This not only slows you down even more, but results in a patchy, irregular cut. By moving steadily at a speed that is comfortable for you, the blade will rotate in a continuous motion that shears the grass evenly. Just like a power mower, the wheels of a manual mower will push down the grass which will spring back up in an hour or two. By overlapping rows on the return, the mower will catch those missed clumps of grass. Overlapping rows also means that you are mowing less grass and that the reel mower will be easier to push. This technique of overlapping is also helpful when the lawn height is a little too high to manage. Don’t be afraid to try cutting at different heights and from different directions. Lawns are usually a mix of different grasses, all of which have different growing patterns. If you don’t light the look of the cut from one direction, come back around at a different direction and try again. Changing the height may also improve the look of the cut, especially in lawns that are a mix of grasses, dandelion, clovers, and quack grass. These mixed grass lawns cut more easily when the setting has been dropped an inch. Be willing to accept that a lawn mowed with a manual push mower isn’t going to look picture perfect. There’s always going to be a few patches here and there that stubbornly refused to be cut and that’s OK. While today’s mowers are rust proof, it’s still a good idea to brush the grass off the blades when you are finished mowing for the day to prevent the buildup of clippings and dirt. After the clippings have been brushed off, lube the bearings and the cutting edge with WD-40, and remember to always keep your reel mower stored safely indoors and out of the elements. Using an eco friendly push reel mower does takes a little getting used to and may seem like a lot of extra work at first. But, by following these simple tips and mowing early in the morning while the temperatures are still cool, you’ll soon discover how easy using a manual push mower can be. This is really helpful! Thank you! I’m thinking about getting a manual mower. Love my manual mower. I raise meat rabbits and the cuttings are a handy suppliment for their feed, my manual mower doesn’t chop up the grass like a motor driven blade. To keep on top of it, I mow at least once a week or the first opportunity after a rain. I use a push mower at home, mostly because for the size of the lawn I need to mow, I couldn’t justify spending too much. The push mower is easy to use if you use it regularly and don’t let your grass mow too long. I would recommend for smaller lawns. Am I supposed to rake up the cut grass afterward or since the grass is not very long anyway, can I just leave it to decompose and maybe help the growing cycle? Or will the dead snippings make the lawn look half dead when they dry out? Most natural minded folk, like myself, leave the grass clippings on the yard to decompose. But that presumes the ground biology is healthy and will allow it to decompose relatively rapidly. If you use chemical fertilizers and herbicides, for instance, the little critters in the soil that break down the organic matter may be few. Spreading a little dry molasses on the yard will help bring them back to life and get the decomposition going. I also mow my leaves and leave them on the yard to provide nutrition for the lawn. Very helpful website. I have two reel mowers. One is Earthwise with 4 wheels and the other is Scotts with roller. The Scotts cut really nice but it is really hard to push? Any idea why the difference? Is it because of the wheel vs roller? Thank you.